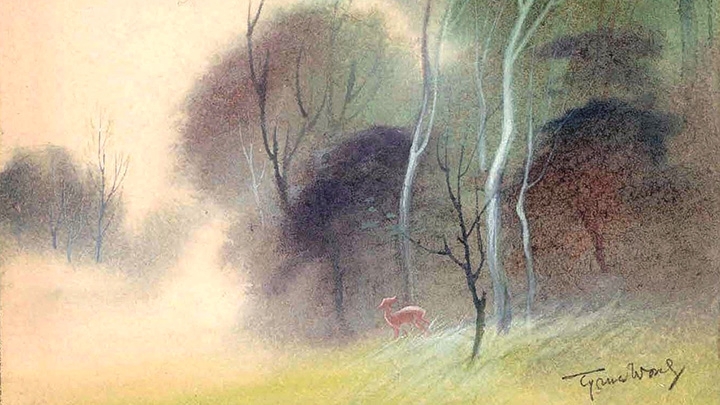 People worldwide have seen the Disney animated classic Bambi and been deeply moved by it, but few can tell you the name of the artist behind the film. Even fewer are aware of this pioneering artist’s impact on American art and popular culture. Until his death at the age of 106, Tyrus Wong (1910-2016) was America’s oldest living Chinese-American artist and one of the last remaining artists from the golden age of Disney animation. The quiet beauty of his Eastern-influenced paintings caught the eye of Walt Disney, who made Wong the inspirational sketch artist for Bambi. Watch American Masters: Tyrus September 8 at 9:00 p.m. on WCVE PBS/WHTJ PBS. Check listings for additional air-times. Previously unseen art and interviews with Wong, movie clips and archival footage illustrate how his unique style – melding Chinese calligraphic and landscape influences with contemporary Western art – is found in everything from Disney animation (Bambi) and live-action Hollywood studio films (Rebel Without a Cause, The Wild Bunch, Sands of Iwo Jima, April in Paris) to Hallmark Christmas cards, kites and hand-painted California dinnerware to fine art and Depression-era WPA paintings. The film also features new interviews with his daughters and fellow artists/designers, including his Disney co-worker and friend Milton Quon, Andreas Deja (The Little Mermaid), Eric Goldberg (Aladdin) and Paul Felix (Lilo & Stitch), and curators and historians of Wong’s work.